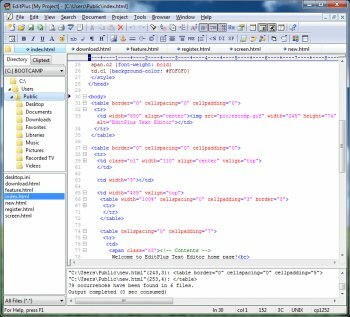 EditPlus is a Text editor, HTML editor, and programmer's editor. While it can serve as a good replacement for Notepad, it also offers many powerful features for Web page authors and programmers. What a fantastic programmer's editor! Whenever I'm using this great quality piece of software I wonder why I was messing around with that "ultra-garbageware" (aka UltraEdit) all these years. Fantastically complete editor. You just have to use it to really appreciate how well it does it's job. Simply a great text editor. I have tried many different editors but this is my favourite. lot of features, customisable, fast and stable. This software is not "bug free". No software is. I would give this editor more than a 5 rating if it was possible. This is my favourite editor. The Clip Library feature saves me hours and hours of work over the year. I have developed a clip called "normal.html" where I have all my frequently used HTML tags and attributes in the one clip and then use EditPlus as a word processor, saving files as HTML - who needs bloated office suites? I agree with the other positive reviews. Bought this several years ago and it's been heavily used since for quick web editing and a lot more. For me, a great mid point between Dreamweaver and the always underwhelming notepad. Powerful, light and just well done for what it is. Anyone else notice that 3.x is a free upgrade from previous versions? Now that's staying classy. There are so many editors out there; some are bloated, huge and hard to use. Others are buggy garbageware or silly kid-ware. EditPlus is an exception to that rule. Minimalistic but feature rich is a real tool. A serious code editing tool for people who really need it. The best text editor (besides Windows) there is. Hands down. I like it so much, that I purchased it. Was well worth it.